Preston*Laing Productions - 194 min. Screenplay: Graeme Tetley and Gaylene Preston, based upon Sonja Davies' book of the same name; Director of Photography: Allen Guilford; Editor: Paul Sutorius; Music: John Charles; Vocals: Lisa Schouw; Producer: Robin Laing; Director: Gaylene Preston. 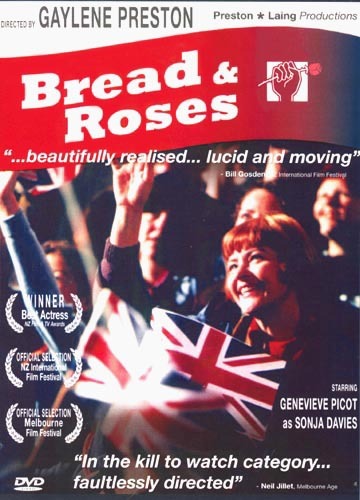 Originally made for TV, but also released theatrically,this is an account of the life of activist and trade unionist (and later MP) Sonja Davies. The film covers her life up to 1956, when, at age 33, she was elected to the Nelson Hospital Board. During this period she develops strong socialist beliefs, marries and divorces, at age 17 trains as a nurse, has a romance (and a child) with an American marine who is killed in WWII action. She battles tuberculosis and marries a former boyfriend when he returns from the war. Toward the end of the film, she becomes part of a women's ill-fated campaign to save the Nelson railway line from closure and begins to be elected to political bodies. A well acted film with high production values. Recommended. No source for NTSC copies. New PAL vhs copies, formated 1.33 with a 2.0 stereo English soundtrack, can be purchased from Aro Video for $50nz (Note: This is for two tapes). As of October 2011, a PAL R0 2-disc DVD set is available from gaylenepreston.com, selling for $40nz + shipping. It is the same set as described above.